The 2.8-tonne prototype was hot helium leak tested in a facility capable of detecting the tiniest microleaks. 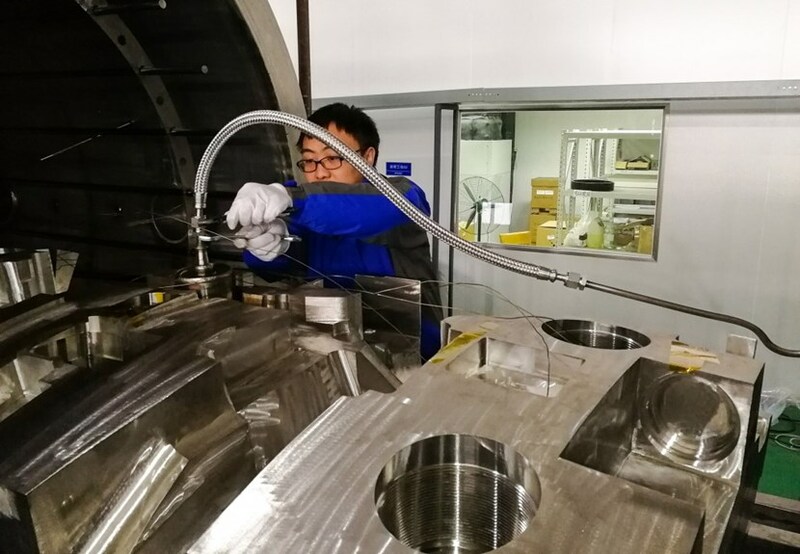 The test results, which showed that the maximum helium leakage rate was well within ITER requirements, have provided valuable reference data for the further investigation of the acceptance criteria for ITER blanket components. 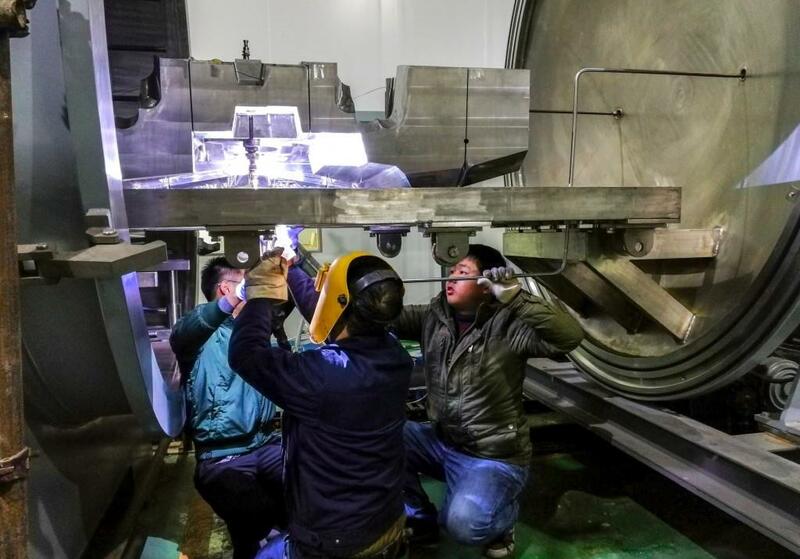 On 14 February, two days before the start of the Chinese New Year, the Chinese Domestic Agency successfully accomplished the last in a series of back-to-back qualification milestones in its program to procure 50 percent of the blanket shield blocks required by ITER. The ITER blanket consists of 440 individual modules covering a surface of 600 m² inside of the vacuum vessel. The plasma-facing surface of the blanket—the first wall—is attached to massive components called shield blocks that provide neutron shielding for the vessel and magnet coil systems. These thick steel blocks, weighing up to four tonnes apiece, interface with many other systems, in particular a large number of diagnostics. For this reason there are a total of 28 major design variants and 150 or more minor design variants. The Chinese and Korean Domestic Agencies are each providing 220 shield blocks. In December 2017, Chinese suppliers in Guangzhou completed an 18-month program to manufacture a full-scale prototype of shield block SB09A. 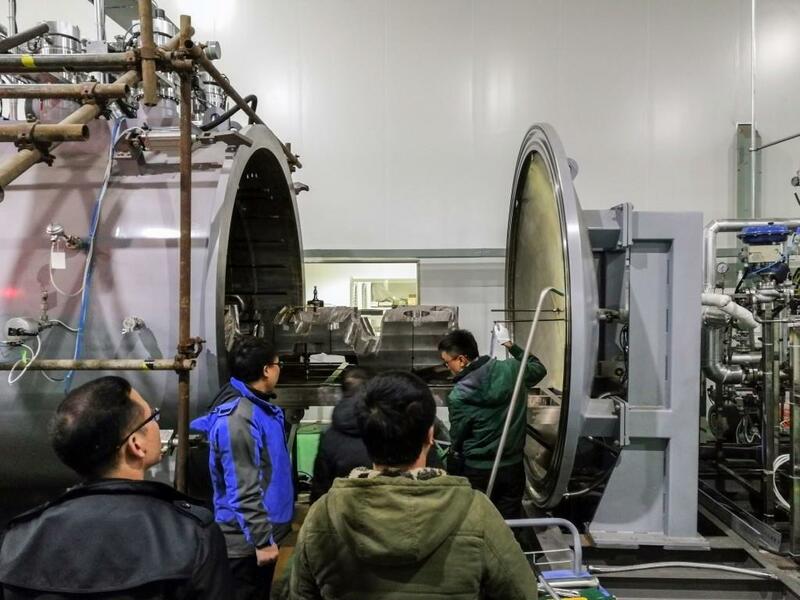 The next month, a dedicated facility for hot helium leak testing was commissioned in Chengdu—just in time to begin test activities on the SB09A prototype. 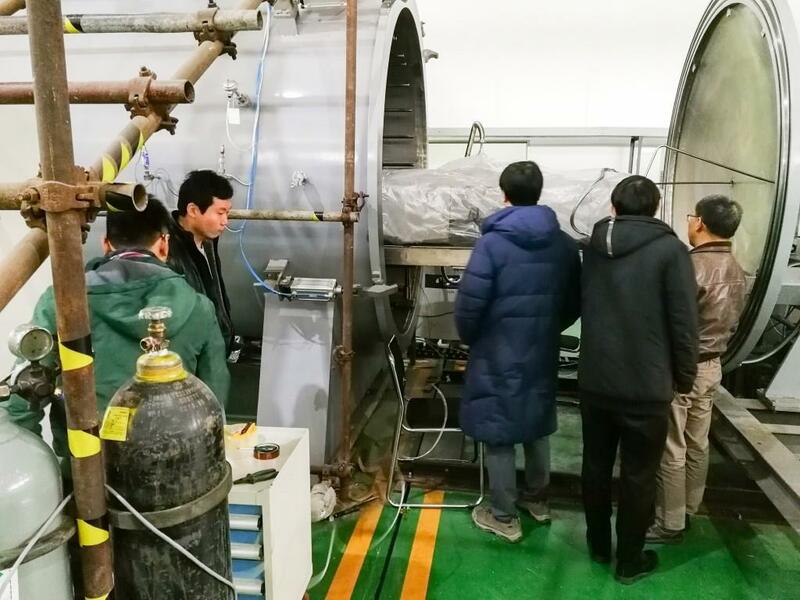 From 6 to 14 February, hot helium leak tests were carried out according to ITER Organization accepted procedures, and witnessed by ITER Organization representatives. The results met all relevant ITER requirements. The shield block module SB09A, located in the upper region inside the vacuum vessel, represents probably the most complex type of shield block structure—making it the most challenging to manufacture of all shield blocks to be procured by China. It has the most complex geometry, with several cut-outs to accommodate interfacing systems and diagnostics, and is largely tapered. For this reason it was selected as a full-scale prototype to qualify the manufacturing technologies that will be used in series production. From 6 to 14 February, hot helium leak tests were carried out according to ITER Organization procedures, and witnessed by ITER Organization representatives. The hot helium leak test represents the definitive demonstration of the fitness for purpose of the component to operate in an ultra-high vacuum environment. 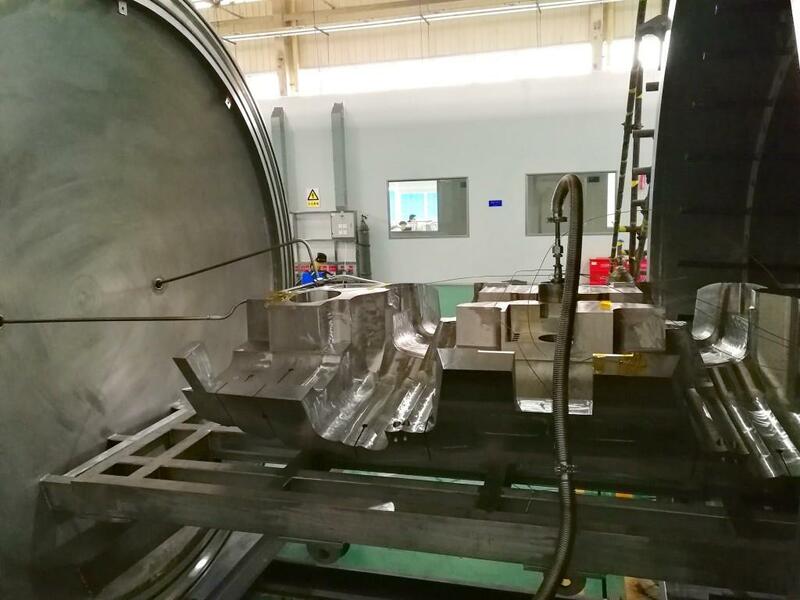 Chinese manufacturers started on the full-scale prototype in July 2016, progressively accomplishing all of the fabrication steps including machining datum, drilling the deep holes of the cooling channel, side machining, welding of cover plates, and final machining. From nine tonnes of original stainless steel forgings, the final full-scale prototype after machining was 2.8 tonnes. Many tests were performed throughout the fabrication process to verify quality—such as preliminary dimensional examination, non-destructive examination, and hydraulic pressure tests, which all showed acceptable manufacturing results. The shield blocks, like all the in-vessel components, have to operate under ultra-high vacuum conditions (ten billion times lower than atmospheric pressure). Therefore stringent design, manufacturing and testing provisions have to be planned in order to ensure that the demanding vacuum requirements are met. In this regard, the so-called hot helium leak test represents the definitive demonstration of the fitness for purpose of the component to operate in an ultra-high vacuum environment. This test foresees the cycling of the components up to the operational temperature and pressure in order to be able to detect the tiniest microleaks, which would not be detectable by other means. 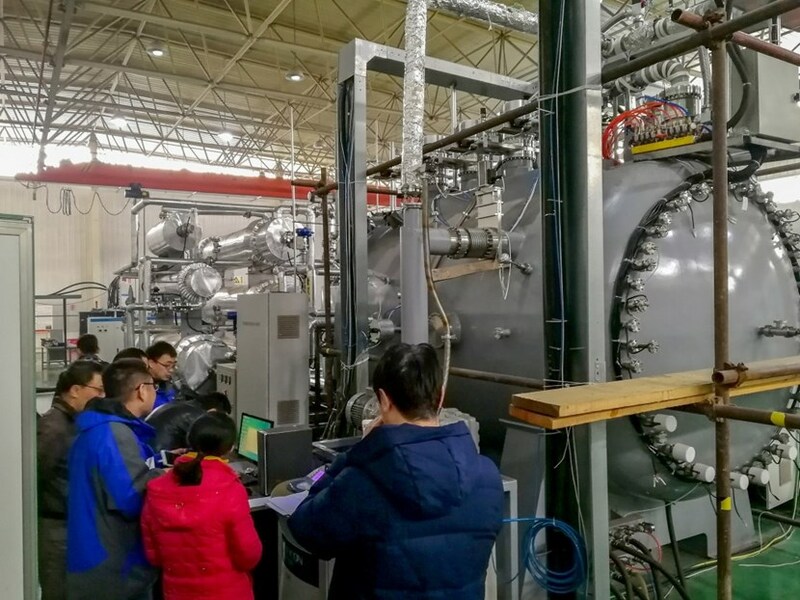 During commissioning tests at the dedicated hot helium leak test facility in Chengdu, operators verified that the sensitivity of the helium detector and the background helium leak rate could reach ITER requirements; in both cases the facility performed well. During two full cycles of testing on the full-scale prototype, results showed that the maximum helium leakage rate was well within ITER requirements. As the first hot helium leak test on a large ITER blanket component, the results provide valuable reference data for the further investigation of the acceptance criteria of ITER blanket components. They also provide an important benchmark for developing hot helium leak test standards for the large vacuum components of future tokamaks. See the gallery of photos below. Module SB09A, located in the upper region of the vacuum vessel, will be one of the most challenging to manufacture due to its complex geometry, numerous cut-outs for interfacing systems, and the fact that it is largely tapered. Experience on the full-scale prototype will be valuable for final fabrication. 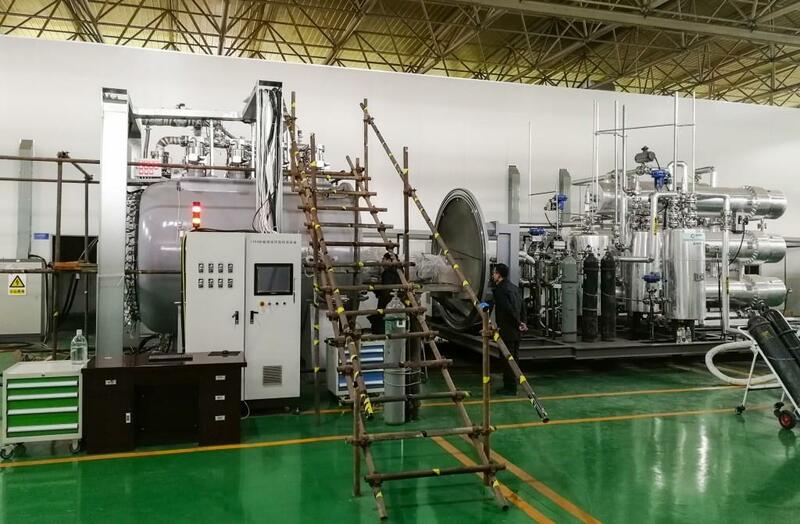 The vacuum test facility was designed, optimized, manufactured, assembled, and commissioned by the Southwestern Institute of Physics (SWIP) and Guoguang Electric Co. Ltd., in Chengdu, China. During commissioning tests in January, operators verified that the sensitivity of the helium detector and the background helium leak rate could reach ITER requirements. 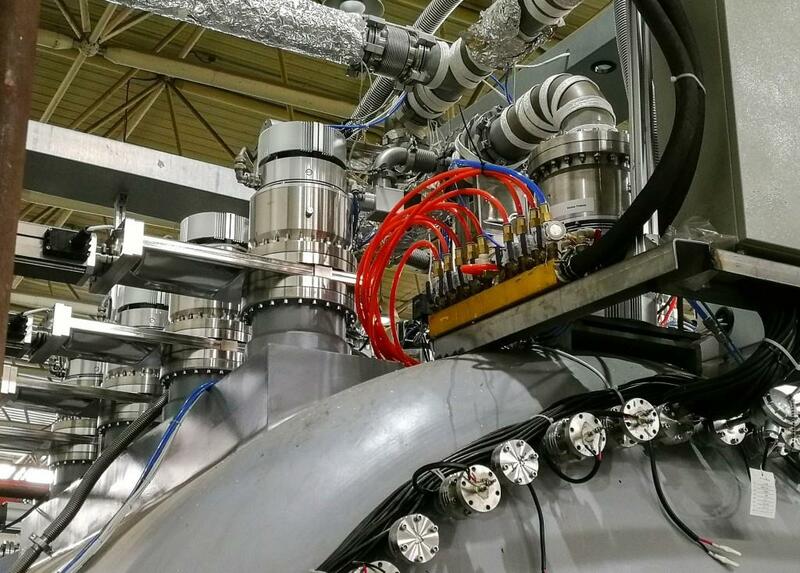 The vacuum test facility in Chengdu has a detector sensitivity on the order of 10-13 Pa.m³/s (far beyond ITER requirements of 4×10-11Pa.m³/s) and a background helium leak rate as low as 3×10-11 Pa.m³/s at room temperature and 1.8×10-10Pa.m³/s at 250 °C (satisfying ITER requirements of 2.69×10-10Pa.m³/s). The SB09A blanket shield block prototype was hot helium leak tested from 6 to 14 February. This last qualification event follows on the heels of tests that were carried out during manufacturing—including preliminary dimensional examination, non-destructive examination, and hydraulic pressure tests. To cover the 600 m² of interior surface in the vacuum vessel, 440 shield blocks are necessary. The Chinese and Korean Domestic Agencies are each supplying 220 modules. Made out of up to four tonnes of steel, the blanket shield blocks protect the vessel and magnet systems from neutrons. But because they also interface with many other systems, including diagnostics, there are a total of 28 major design variants and 150 or more minor design variants. SB09A is one of the most complex.